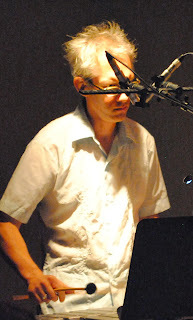 The composer/pianist John di Martino has a reputation among vocalists in the know. The word is if you have a project and want to do something special, get this guy to arrange and play on your record. His well-deserved reputation for being the consummate accompanist/arranger comes from a deep and abiding love and respect for the lyric of a good song. A superb technician, John’s training with two pianists Jimmie Amadie and Lennie Tristano, and later briefly with the saxophonists Lee Konitz and Warne Marsh, gave him a deep rooted sense of time, space and the judicious use of notes. But it was listening to vocalists that his mother would play for him as a youngster in Philadelphia that made him deeply sensitive to the lyrics and the emotional impact they could have on a song. Tristanto would make di Martino sing the solo parts of great horn players to learn phrasing, the key to emotional content. It was a lesson that stuck . John took his talent and his love of lyric and found work in the then thriving Atlantic City casino scene of the nineteen eighties, where his trio became the house band for the now defunct Golden Nugget. He found himself playing behind a myriad of performers from Billy Eckstine to Keely Smith, sometimes backing the vaudevillian shtick of a comedian like Milton Berle or comping for R & B singer Chico DeBarge. Through it all he cultured a journeyman’s attitude, learning by necessity to play various kinds of music as the situation demanded. Instead of coping an attitude, judging the music for its lack of complexity or creativity, he made it his practice to extract different values from each musical experience no matter how mundane. His love of Latin and Afro-Cuban music and his ability to absorb its rhythmic nuances landed him extended gigs in the bands of percussionist Ray Barretto and later the drummer Bobby Sanabria. As the word spread about this unassuming pianist who could deftly make any singer sound better, di Martino became a sought after partner by vocalists, especially jazz vocalists. He has worked with Billy Eckstine, Jon Hendricks, Janice Segal, Giacomo Gates, Freddy Cole, Gloria Lynne and Grady Tate to name a few. So it was with great curiosity that I decided to listen and review one of John’s recent works, this time as a leader on Turnaround his recent cd from 2012. Turnaround is a piano trio album consisting of thirteen songs, mostly under-recorded gems that John believes are fertile material for further exploration. 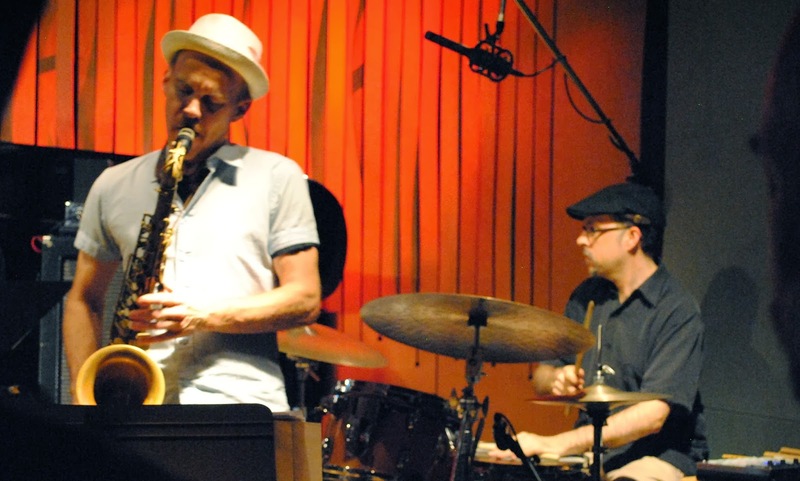 The trio is as tight and interactive as there is in jazz, with bassist Boris Kozlov and drummer Alvin Atkinson providing superbly intuitive accompaniment and support. For a musician who is often found on the sidelines of somebody else's project, John’s out front playing on Turnaround is a revelation. On the title tune, Ornette Coleman’s “Turnaround,” di Martino plays the staccato theme with a touch of McCoy Tyner percussiveness and a fluidity that is impressive . Despite the Blues roots of this song, John creates an outpouring of ideas that never cease to surprise and often stirs in the listener an emotional response. Atkinson’s gentle stick and rim work is sublime and Kozlov’s plump bass lines suspend in the air like billowy cumulus clouds hanging on a blue horizon creating a cohesive sound. On the neglected , depression- era Jay Gorney composition, “Brother Can You Spare A Dime” John and his trio set off on a loosey- goosey jaunt reminiscent of the brilliant Hampton Hawes trio of the mid-nineteen fifties. The trio of Hampton Hawes on piano, Red Mitchell on bass and Chuck Thompson on drums, could make the music flow with an unvarnished honesty and supple buoyancy that was unmatched creating magic. The carefree, inhibition to swing that Kozolv, Atkinson and di Martino demonstrate here is not easily achieved. The interactivity of this group is impressive, they create their own kind of magic. Boris Koslov’s walking bass lines echo some of Red Mitchell’s work and Atkinson’s brushes subtly maintain that steady, unerring swing with deceptive ease .Like Hawes, Di Martino’s playing emits an air of joyfulness that is genuine. Mr. di Martino has a library of unheralded songs that he likes to draw from and one such piece is the soulful “The Sun Died” from the Ray Charles repertoire. This bittersweet shuffle is made all the more poignant by Koslov’s mournful bass lines and John’s piquant keyboard work. The album features two Billy Strayhorn tunes. On “A Flower is a Lovesome Thing ” Mr. di Martino transforms Strayhorn’s lament to a more uplifting tale with his use of Brazilian rhythms. John’s washboard-liker ostinato piano lines in the lower register are perfectly counterpointed by Atkinson’s regimentally cadenced snare and cymbal work. The song sways its way in a genteel dance of sorts, as Mr. di Martino’s rhythmic piano lines pitter-patter across the melody line. Eventually Mr. Atkinson is given a chance to stir things up with a brief but potent string of poly rhythms ending in a abrupt climax. Another unearthed lost gem is “Moon and Sand.” John ‘s sensitive playing exemplifies the beauty of this tender ballad. Di Martino and Kozlov have a special chemistry playing off each other’s ideas, made possible by John’s knack for inspired arrangements. You can hear snippets of different vaguely familiar songs in John’s playing, the man is steeped in the history. He meanders through lines of a song each time like he is rediscovering anew. On Eddie Harris’s “Cold Duck Time” John captures the flavor of Harris’ funky style, with touches of the Ramsey Lewis sound surfacing in his playing. This is just plain get-down fun and has you nodding your head to the beat. What becomes apparent is the versatility of John’s playing. He is a chameleon of sorts who has the ability to adapt to a variety of styles while retaining his own voice, but at its core his music possess an underlying sense of enjoyment, the man revels in playing music. The more contemporary Stevie Wonder composition titled “I Can’t Help It,” is turned sideways by arranging the song using a Latin rumba rhythm. The composition features a fleet bass solo by Kozlov and the soft touch of Atkinson on toms and snare. The album ends with other Strayhorn tune “Passion Flower” played as a somber dirge with Atkinson’s muffled toms recreating an Ellington-era sound. Di Martino’s piano is particularly romantic in its approach and. Kozlov’s arco bass solo is achingly evocative. “Sweet Pea” would approve. 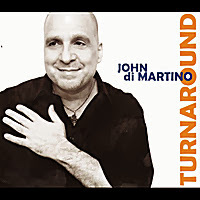 With Turnaround, The John di Martino Trio establishes itself as a force to be reckoned with and John’s stature as a superb pianist and arranger is further cemented adding to his already confirmed credentials as one of the business’ best accompanist. On this past Friday evening at the Firehouse 12, in New Haven, CT- easily Connecticut's premier venue for modern jazz- the outre modern drummer/composer John Hollenbeck and his Claudia Quintet charmed an astute audience with his unique musical vision. Hollenebeck is a truly gifted drummer with an inquisitive nature, but it is his combined notated and improvised compositions that straddle the boundaries of music and aural art. As a student of the great Bob Brookmeyer, who he credits as one of the most important influences in his life, he carries on a thirst for composition for and arrangement of multiple instrumentation and the sounds it can produce. As is his custom, Hollenbeck often uses the month of September as a time to take up an artist residency in remote places. There he uses the quiet time to write and compose new work. His latest album is titled September and it is a compilation of music that John created during his latest residency last September. Each song is titled with a date in September related to their conception and a more informative subtitle. Drummers have often reached beyond the traditional drum kit to supplement their sound and Hollenbeck is no exception, developing an array of techniques that allow him to produce sounds that expand his aural palette. With the Claudia Quintet he has found like-minded band mates that can take it a step further, adding complimentary timbres, colors, and tones to his own array of percussive techiques and poly-rhythmic beats. Of his latest work September Hollenbeck says " I am especially interested in how, through the simple non-violent act of composition, one can help oneself become a better person, deppen one's connection to humanity, and create work that can soothe and heal." 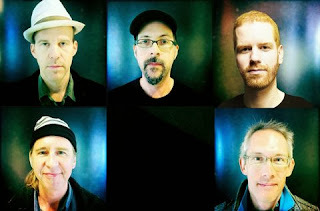 As a composer, the sounds of Matt Moran's vibraphone, Red Wierenger's accordion, Chris Speeds reeds and ChrisTordini's bass add pliable voices that serve Hollenbeck's compositional purpose. Despite Mr. Hollenbeck's serious demeanor there is a bit of a tongue in cheek feeling to some of the things he uses to convey his musical message. A humanity that shines through the purposefulness. The set started out in silence as Mr. Moran and Mr. Speed set the contemplative tone of the first number titled "September 17th" subtitled "The Loop Song." Mr. Moran's hollow, tremelo-filled sounds mesh in chamber music-like fashion with Mr. Speed's darting,woody clarinet evoking a free dance ensemble. Eventually Mr. Weirenga's accordion enters squeezing each chord in perfect harmony as Mr. Hollenbeck scrapes the sides of his cymbals creating eerie accents. Hollenbeck eventually changes the serene mood by introducing a steady rhythm with Mr. Tordini and by interjecting some of his looped vocal overdubs ( this one repeating the word "Hindsight"). Mr. Hollenbeck has a series of pre-recorded loops at the ready, some of them echoing sounds like sirens, most of phrases stolen from news announcements or historical speeches, all adding penetratingly to his musical message. he has of September. A restorative work. 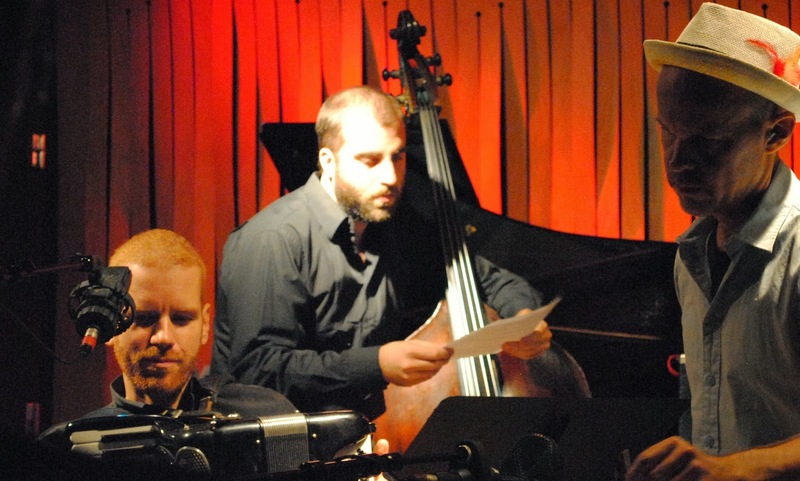 John took to the microphone explaining the next composition, a dedication to his friend and the pianist Jason Moran, whose email tagline is lemons. The tune is appropriately titled "September 18th- Lemons." John starts out with a driving rhythm that serves as the background for a repeating, serpentine line combining the sounds of Speed on tenor, Weirenga's accordion and Moran's vibes. Hollenbeck eventually changes the beat, slowing it down to a marching-like cadence that has his fellow instrumentalists lending sporadic accents. The sound decays like a dormant space craft losing orbit and descending into the open abyss. The time shifts in this song are quite dramatic, yet Hollenbeck navigates them with consummate skill. He utilizes chains and paper on his drums to create a cacophony of disruptive and unusual sounds. Speed's tenor solos over a eerie dirge that Hollenbeck, Moran, Tordini and Weirenga build to a intense conclusion. Hollenbeck starts the next composition titled "September 29, 1936- Me Warn You" with pounding mallets over taught toms. Looped segments of FDR's voice from the his Democratic National Convention speech of that year are deftly added to the mix creating a surreal awareness of a message. This piece is more akin to performance art than traditional melody based music. The musicians key off of the repeated spoken lines and the cadence of FDR's words define the melody and the rhythm of the piece. Matt Moran, using violin bows against the sides of his vibraphone's bars, creates his own unique droning sound. With his wild mane of light hair, Moran looks like Christopher Lloyd's mad scientist from the movie "Back to the Future," and vibraphonist can play frenetically at times in a whirling dervish kind of way. The most moving piece of this set was the composition titled "September 22- Love is It's Own Eternity " This peaceful ballad had a languishing quality accentuated by Weirenga's droning accordion and Moran's lingering tubular sound. Bassist Tordini provided a penetrating bass solo that hovered over this floating cloud of a song. Hollenbeck played brushes to perfection and Speed's tenor was subtle and subdued lulling the audience with its beauty and sensitivity. Hollenbeck decided to go back to his earlier repertoire for a song titled "Flock," composed at a time he was doing a residency in Scotland. John took to the piano, pounding out singular notes in a rhythmic pattern that is then picked up by his fellow musicians. Much like the lead goose leads a flock, calling out to his fellow travelers, giving them direction, the band is guided musically by Mr. Hollenbeck's lead sounds. If you closed your eyes you could see the formation of downy birds flying over the horizon. The final song of the first set was titled "September 9th- Wayne Phase," a song inspired by the saxophonist Wayne Shorter, but clearly not Shorter-esque in sound. Weirneger's droning accordion moans as Moran's vibes track the melody over Hollenbeck's snare rolls. John's poly-rhythms create the backdrop for a series of solos. Weirneger solos, first creating a sound that combined with Hollenebeck's frenetic traps present the aura of a runaway calliope. The repeated melody line is broken with a series of sounds that emanate from the players in a controlled but free-like exhibition of coordinated frenzy. A high-light of the album, which was disappointingly not played during the first set, is the haunting "September 12th- The Coping Song" written the day after the attacks on the Trade Center Towers when Mr. Hollenbeck was in residency in upstate NY. This chamber music-like piece utilizes the beautiful sustained tones of the accordion, the resonant sound of the clarinet and the lingering, hollow sound of the vibes to great effect. The ostinato that Mr. Hollenbeck creates is at once somber and up-lifting,developing a sense of promise and expectation out of a cloud of disbelief and shock. Mr. Hollenbeck's vision of September is one of hope and creativity. He has a unique mind that can envision sounds from various real life situations and compose them into accurate statements of the human condition. At times the beauty of his music offers us a glimpse into the magnificent possibilities. Cassandra Wilson has been touted as one of the finest jazz vocalists of her generation. At the heart of it all she is a Mississippi girl who was raised in Jackson and absorbed some of the area’s Delta blues tradition into her soul. Coincidentally, Ms. Wilson was also affected by the contemporary sounds of the folk and rock music of her generation. Like any inspired innovator, she found a way to introduce songs she grew up with into her repertoire. 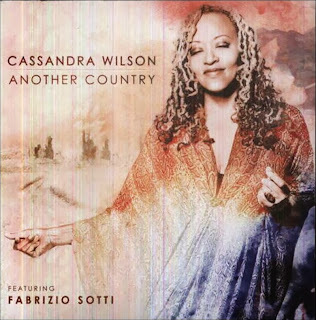 Songs by artists like Van Morrison, Joni Mitchell and even the Monkees, reworking them into minor masterpieces of a hybrid sound that is pure Cassandra Wilson. She possesses a voluptuous contralto voice that she has honed into a marvelously supple instrument. She can alter timbre and tone with precision and purpose. Her relaxed, conversational delivery is more folk/blues than jazz-like, but yet she is an improviser at heart retaining a jazz sensibility in her music. She is a stylist more than a traditional singer, bringing her own unique interpretation to songs that we thought we knew. Sometimes, after hearing her versions, we realize that we really didn't have a clue. For all intents and purposes she defies categorization. On this the opening evening of the Performing Arts Center at Purchase College’s 2013-2014 season, Ms. Wilson was joined by her latest band members. Her musical director, the Swiss chromatic harmonica player Gregoire Maret, the pianist Jon Cowherd, the bassist Lonnie Plaxico, the guitarist Brandon Ross and the French percussionist Mino Cinelu opened the show with a soulful but sweet instrumental . After the opening warm-up from the band Ms. Wilson walked on the stage to enthusiastic applause. She started the set with a Delta blues inspired song featuring the sparse but effective solo guitar work of Brandon Ross. Ross has the patience and skill to slowly build ever increasingly interesting fragments of a song from what seems, at first, like randomly selected notes. His twangy lines emerge revealing the barest hint of an identifiable rhythm allowing long spaces for bent, scratchy notes to simmer in the air like the smell of cooked greens on a hot stove. You can feel of the blues emanate from the body of his steel guitar as he introduces Charlie Patton’s “Saddle up my Pony.” Chromatic harmonica player and musical director Gregoire Marmet took up a bass line on a large mouth organ that emanated low register sounds like a reedy old pump organ. Ms Wilson’s deliberately paced contralto reading of the lines added the final touches to this blues classic. The second selection was the title song from her latest CD Another Country. The song has a swaying rhythm that is provided by finger picking by Ross, a walking bass line by Plaxico, some hand percussion by Cinelu and some harmonica accents by Marmet. Mr. Marmet is an accomplished chromatic player who has a sweet sound that lacks the growl of a real blues player-more Toots than Stevie. Ms. Wilson’s husky voice easily modulates in a cadence that mimics the song’s rhythmic sway. Twenty years ago Ms. Wilson released her first Blue Note album titled Blue Light Till Dawn, so appropriately she played Van Morrison’s “Tupelo Honey” from that CD. In many ways Ms. Wilson’s languid delivery takes all the yearning sentiment out of the Irishman’s originally touching version. The re-working, while certainly her own interpretation, is just a bit too listless, devoid of the earnest soulful energy that Mr. Morrison so deftly gave to the original. Mr. Marmet’s sickeningly sweet harmonica only accentuates the divide relegating the song into schmaltz, Mr. Plaxico’s buzzing arco bass at the coda a bit gimmicky. Ms. Wilson’s willingness to cross artificially created musical boundaries is part of her appeal. It may not always be a successful endeavor but she certainly has the fortitude to try to expand her musical palette. Mr. Cowherd and Mr. Plaxico started the next song “Angola” with an ostinato piano/bass line with a distinctive samba-like rhythm that seemed to energize Mr. Cinelu on hand drums. Ms. Wilson clapped her hands and slithered around the stage to the beat as she sang in Portuguese. When Mr. Cinelu harmonized with her voice it was quite pleasing. Ms. Wilson took a cabasa out of Cinelu’s hands and the two had the audience clapping in time. Mr. Cinelu exhibited an animated exuberance that grew in intensity as the rhythm section of Plaxico, Ross and Cowherd pushed the pace. Mr. Cinelu exhibited a poly rhythmic finale that had the audience cheering. In a demonstration of where Ms. Wilson’s re-workings of a song are most effective, the most poignant part of the evening was when Ms. Wilson and Mr. Ross played the Jimmy Webb classic “Witchita Lineman” from her album Belly of the Sun. Here Ms. Wilson’s purposefully slow and deliberate take accentuated the poignancy of Webb’s simple lyrics to perfection. The hushed audience was mesmerized and Mr. Marret’s saccharine sound was able to punctuate the mood to perfection. In speaking about her musical upbringing in a recent NPR interview Ms. Wilson said “I still love the piano, but the guitar is my heart.” On “Red Guitar,” from her latest CD Another Country, Ms.Wilson picked up a red telecaster-like electric guitar and sang. There is little need for her to play with such an able guitarist as Mr. Ross doing all the heavy lifting here, but it is a homecoming of sorts for Ms. Wilson. It was her early folk/rock/blues playing in coffee houses and such, often self-accompanied on guitar, where she learned to nuances of her voice and formed the essence of her style, so it was nice to here her return to this less produced format. The audience agreed. Mr. Cowherd’s sensitive side was heard on an unnamed instrumental duet between him and Mr. Maret. Mr. Cowherd can play beautifully and his unassuming demeanor belies his talent. Mr. Maret seemed to thrive in the pairing, not over playing, simply adding sparse contrapuntal accents that matched Mr. Cowherd’s chords perfectly. Ms. Wilson’s successful integration of pop songs into her vernacular is probably best demonstrated by her re imagining of the Monkee’s hit “ The Last Train to Clarksville,” which she first covered on her Grammy award winning album New Moon Daughter from 1996. On this version she proved that she can continue to make otherwise generic songs into her own minor masterpieces. Mr. Cowherd was particularly soulful on this one and Mr. Plaxico was rock steady throughout. She left the stage as Mr. Maret and the band took the song out. After a standing ovation Ms. Wilson returned to the stage and appropriately ended the set with a blues. Mr. Ross , who never left the stage-tuning his guitar throughout the applause, led off with his pungent guitar lines that slowly but surely develop into a four bar blues line. The band builds this slow-cooker in stages as each instrument enters adding more fuel to this simmering fire. Ms. Wilson’s smoky alto is center stage as she walks us through the Son House lyrics of “Death House.” Ms. Wilson first did this song on her New Moon Daughter Album and it is the authentic pathos of her singing on this song that firmly establishes her as a true blues artist of major import. On this evening however, after a few verses of Ms. Wilson’s heart wrenching vocals, (which we could have used more of), the band took the song as a vehicle for extended improvisation by Mr. Maret. Despite the crowd’s applause during Mr. Maret’s endless solo, as a harmonica player myself, I am particularly sensitive to the effectiveness of a harp in music and especially within the blues idiom. For me, Mr. Maret’s indulgence detracted from the performance. I would have preferred fewer choruses with a bending diatonic harp for this song in keeping with the blues tradition, but that is just a personal preference. More importantly, as musical director, Mr. Maret, no matter how talented a player, must realize and that using the harmonica sparingly is the most prudent course. On this point perhaps Mr. Ross, whose judicious use of space on his guitar is exemplary, could be his guide. Ms. Wilson’s voice is the feature here and she did not disappoint, although it would have been nice to hear more of her and a little less of her band. Despite a generally pleasing performance, it was a bit disconcerting that to me that at times it seemed as if the band was featured more than the headliner. The Performing Arts Center at Purchase College has a fabulously eclectic season planned for this year. Its schedule can be found at here.